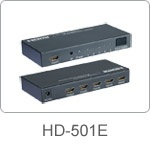 The HD-501E routes high definition video (in multiple resolutions up to 1080p) and digital audio from any one of the several sources to display units. All the inputs accommodate the connections of the high definition video sources simultaneously, such as satellite systems and HD DVD players. The output sends the high definition audio/video signals to a high definition display. Switching is done via the IR remote that is provided with the unit. 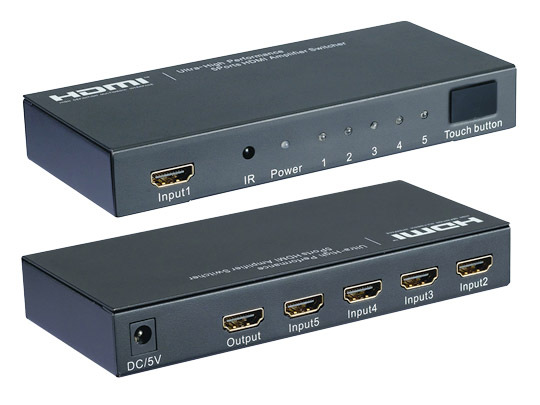 • Support with HDMI 1.3b. • High performance up to 2.5Gbps. • Support 12-bit Deep Color. • Maintains high resolution video - beautiful, sharp HDTV resolutions up to 1080p, 2k, and computer resolutions up to 1920 x 1200 are easily achieved.